Location of family pit bull attack that left a man dead and a woman seriously injured. UPDATE 02/17/18: On Thursday evening, Owensboro Police and Owensboro Fire responded to a home in the 2300 block of Heritage Park Drive at about 6 pm after reports of a dog attack. When police entered the home, they shot and killed a large aggressive dog and tasered a beagle. Police found David and Dana Brown on the ground with injuries after trying to break up a fight between two family dogs. It has now been confirmed that the larger aggressive dog was a family pit bull. In a Messenger-Inquirer article, which is behind a paywall, Daviess County Animal Control Director Ashley Clark described the large dog as a pit bull. This confirms what multiple people close to the case have been stating on social media in the aftermath of Thursday's attack. David G. Brown, 46, was pronounced dead at Owensboro Health Regional Hospital after the attack. As of Friday, his wife Dana Brown, 45, was also hospitalized at the same location and listed in fair condition. Officer Andrew Bell, public information for the Owensboro Police Department, told the Messenger-Inquirer that Dana told officers the incident began after the family pit bull and beagle got into a fight. When Dana tried to break up the fight, she was attacked, Bell said. When David came to help, he was also attacked. "He jumped in, and they turned on him," Bell said. Daviess County Coroner Jeff Jones said the attack was a factor in Brown's death; he also had heart issues. Clark provided additional details about the couple's dogs, noting that they were all fixed and well cared for. "The dogs were well-taken care of," Clark said. "They were clean and fixed. You could tell they were beloved pets of the family." The pit bull "was probably 90 pounds," Clark said. The family's third household dog, a dachshund, was also attacked by the pit bull during the fight. The surviving dogs were removed from the home and will be placed with family members, Clark said. Owensboro, KY - A man is dead and a woman was injured after being attacked by a dog, according to information provided by the Owensboro Police Department. The attack occurred around 6:00 pm in the 2300 block of Heritage Park Drive in the Heritage Park neighborhood in Owensboro. At least three dogs resided at the home, but apparently only two were involved in the attack. A responding officer shot and killed one of the dogs after it tried to attack the officer. 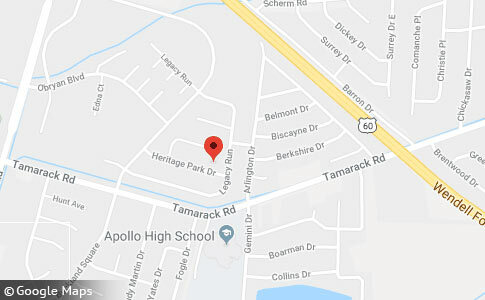 Archive dispatch calls from Owensboro Fire -- accessed through Broadcastify.com -- indicate traumatic injury from a dog attack involving at least one victim. "Engine 3 response for a traumatic injury in reference to a dog attack ... Heritage Park Drive ... Do have OPD in route. Two dogs are still outside that attacked the subject ... Engine 3 response for a traumatic injury in reference to a dog attack. Ambulance is already responding ... male that was attacked by two dogs," she states. A few minutes later, the dispatcher states, "Male subject was attacked by two dogs and went inside his residence. Caller is advising someone is possibly giving him CPR at this time. Just use caution as the two dogs are still in the front yard." A variety of unverified Facebook comments from people close to the case indicate the surviving female victim went into emergency surgery, the man who died may have also suffered a heart attack and that the culprit was a family pit bull. Continuing on the 14 News comment thread we were viewing last night, more people directly involved in the case spoke out Friday morning. Casey Cecil, who would not "say the breed," said her son was there and that police shot the dog when it chased her son into a car. "My son was there and was the one that called the cops for help." Melody McKinney said her daughter was there too, "She too can't get the screams out of her head." McKinney stated the dog was a pit bull. Both Cecil and McKinney agreed, "If any one of our kids tried to intervene more than they did, we would be planning their funerals today." 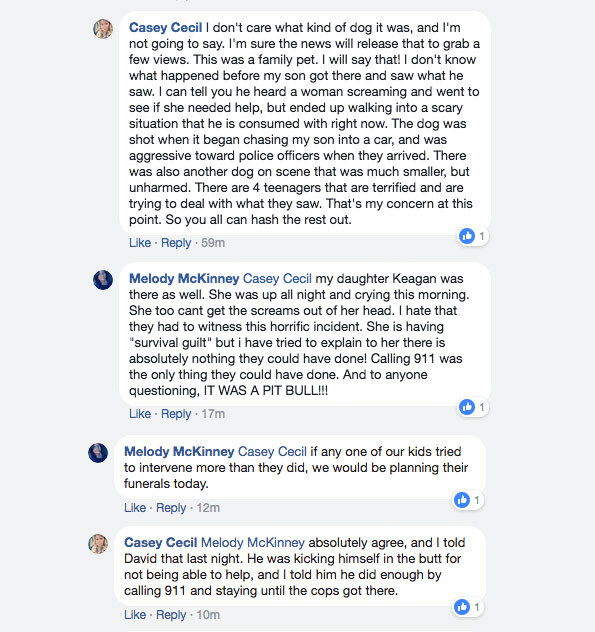 McKinney added, "They [the kids] also kept the wife from being attacked and some neighbors who had pulled up and got out of their car. The kids were screaming, 'Get back in your car' because the dog was headed their direction. They saved several lives last night. Including their own!" We are still waiting on confirmation from Owensboro police. 14 News released an update Friday afternoon confirming some of the Facebook comments. Responding officers arrived to a scene of two aggressive dogs; they shot and killed one of them due to its aggression. When officers entered into the Heritage Park home, they found an injured man and woman lying on the floor. Both suffered injuries while trying to break up a fight between their family dogs. Police have identified the couple as David Brown, 46, and Dana Brown, 45. David Brown did not survive his injuries. The Daviess County Coroner’s report states that he suffered a cardiac arrest that was complicated by the dog attack. Last night people close to the case said that Dana underwent emergency surgery. Comments from this morning indicate that four teenagers were near the scene, one even called police for help. Multiple people close to the case have stated the attacking dog is a pit bull. Presumably, the same animal police shot to death. Another pit bull owner who was fatally attacked by the dog. More lives could have been saved had they not got America's murder dog for a pet. BSL protects people from their own stupidity. KaD — This is a dog bite fatality. We exclude proximate cause deaths. The coroner stated it in his finding. Any time you read "complicated by" or "complications due to" dog attack, that is sufficient. The dog bite injuries were "severe", the bite injuries and attack contributed to his death. Based on the dispatch calls and what the teenagers witnessed, this was a severe attack. It could have turned into a rampage attack too, if the dog had not been shot to death. But 'dog-aggression' is safe for people, right? That's what my friend the dog-fighter told me! Argh, I hate that DA lie that dogs can have dangerous and even lethal aggressive behaviors toward their own species but be safe with humans. That's just nuts. Dogs that act violently are dogs who are practicing violent behavior and arousing into states where they no longer control their own actions. That's inherently dangerous to anyone nearby, as the many cases where people get mauled or killed breaking up a pit attack show. "I don't care what kind of dog it was and I'm not going to say." You have to love the way it's become impossible to discuss a mauling without admitting the pit bull involvement, even if it's just by saying that you absolutely refuse to discuss the issue at all. We thought it was so interesting how the two mothers handled it so differently. They had the same shared experience of their children being near the scene (and witnessing part of the attack). One catered to "I'm not going to say" and the other screamed PIT BULL. They later go back and forth about their shared experience and do not mention this issue again. Pit bulls are known to be dog aggressive, the thought of having one around smaller dogs like dachshunds and beagles is just irresponsible. It's ridiculous in this day and age that people don't do the research on the history of fighting dogs and the descendants of those dogs (now often being dumped in the shelters because their owners have found them to be dangerous and/or unmanageable). Besides the genetic issues with the breed, the fact is if any dog is attacking other family pets, there are serious behavioral issues with that dog that shouldn't be ignored or minimized. This weekend I went to the local animal shelter to drop off donations. In the large dog are there were about 45 dogs and about 3 were breeds other than pits. The small dog area had mostly toys but they actually stuck two smaller pits in those kennels. I read many of the cards on the cages and there were at least 5 that were abdopted out and brought back for not getting along with another dog or a family member. One even said for fighting and the dog had two large, fresh, pink, hairless scars on its head. I was surprised that the shelter had comments this honest on the cards. As mentioned by other posters, dogs that are dog aggressive are never safe. When a fight breaks out, it is a reflex of the owner to try to stop it and getting in the middle can be a death sentence. I really wish there was a shelter near me that did not cater to these dogs (because that is what they are doing and that is where they are spending most of their resources). As far as this latest death, I am not surprised. I am relieved that it was the adult owner and not an innocent who was attacked. Christy D, if your local shelter is stuffed to the gills with pit bulls, stop donating to it. Just stop. And tell your friends to do the same. If these shelters start feeling the pinch in their pocketbooks, they'll change their tune real quick. Animal shelters will change there tune if we don't give them money? We can only hope! I have rescued three dogs and none of them were pits! I do my part to help normal dogs! I won't support the pit pushers! You don't even need to make much of an effort to adopt non-pit shelter dogs; that's what the public is doing anyway, no matter how hard the pit lobby tries to convince them. I just did a search of my local animal shelter — there are pit bulls who have been there over a year. Meanwhile, the young non-pit bulls have all been at the shelter only a few days and will no doubt get adopted soon. There's a group here that attempts to rescue the most un-sought after shelter dogs (Austin Pets Alive — Colleen, you are probably familiar with them). They've got pit bulls, they've got chihuahuas, and they've got mixed breed dogs that are obviously part pit bull but they just give them a different name to help out their chances.